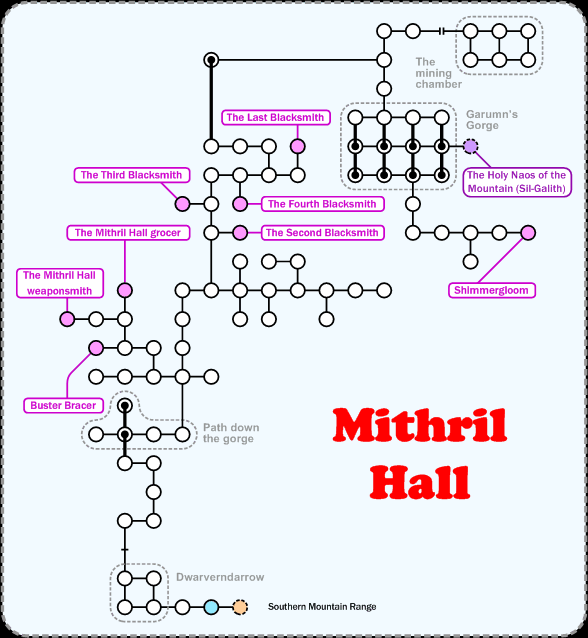 Mithril Hall is a fantastic area for both leveling and golding. Unfortunately, having people in the area trying to do each isn't much fun. Mobs of note are Buster Bracer, who makes the Ravager EQ, and Shimmergloom. Walk ( 6s, ne, 2s, se, 2e, s, 2sw, u, nw, ne, 2w, sw, 3s, 2se, sw, 2u, w, nw, w ) to get from DH to the room marked in blue.